In Successful Onboarding, Mark Stein and Lilith Christiansen challenge established norms on what leaders should expect from their investment in hiring. Stein and Christiansen provide a framework for driving improvements in the new hire experience and delivering better performance for the business. 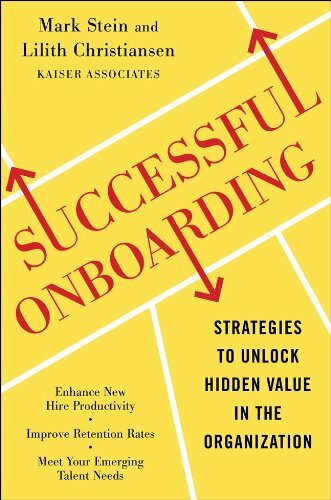 Successful Onboarding was written to help you unlock hidden value from your talent base, improve retention of the best new hires, achieve higher levels of productivity, faster time to productivity–and greater realization of the organization’s strategic goals. In the book, Stein and Christiansen share insights from their study of the circumstances that determine new hire success stories as well as disappointing and costly failures. They provide case studies from their personal experiences leading many onboarding redesign initiatives at top companies, as well as the results from their examination of onboarding practices employed by a large number of Fortune 500 organizations. You’ll discover how they make the business case for onboarding and how you can make the case within your organization. Successful Onboarding is not simply an improved orientation to the organization. It is a total system for success that is woven into the entire experience in the course of your new hires’ first year. A framework is introduced for undertaking a successful onboarding redesign initiative that is tailored to an organization’s circumstances and specific objectives. The book outlines the necessary components for a successful onboarding design: support for how your new hires can master your culture; development of professional and personal relationships that will increase performance; systems to provide early career support that stimulate engagement and commitment; and a deeper understanding of your company’s strategy, and how this strategy translates into direction for the new hire. The result is a revitalized employer-employee compact that advances both parties interests — a true win-win scenario that Stein and Christiansen call the Onboarding Margin™. Explore this website further to learn about achieving Onboarding Margin. For more information please feel free to contact Mark Stein or Lilith Christiansen, and place an order for the book from your favorite bookstore (including Amazon, Barnes and Noble, and Borders). An approach to transforming your organization’s onboarding process from a one-time transaction to a sustained and integrated employee experience that drives performance and engagement right out of the gate. This is an important book for business leaders who want to assure employee engagement from Day One! Practical and instructive, the book gives leaders everything required to plan and implement an onboarding strategy that provides maximum organizational benefits. Not only does the book convincingly build the business case for excellence in onboarding, the authors lay out in the clearest of terms a ‘recipe’ to assist practitioners to plan and implement a strategy that will contribute the results we are all looking for….engaged employees who choose to build a career in our organizations and contribute to organizational success in the long term!! Well done, Mark and Lilith!! Bonnie DuPont, Corporate Director; Former Group Vice President, Corporate Resources, Enbridge, Inc. Successful Onboarding could easily be titled Maximizing Your ROI. If you adopt the authors’ perspective and follow the best practices they present, your organization will get the greatest possible return on its investment in new talent. Stein and Christiansen’s work will shift your focus from activities to results.